The Dutch wholesaler in paint, Claasen Coatings, offers its clients a mobile form app to fill in applications. Paint wholesaler Claasen Coatings is the partner for professional paint for buildings such as Sigma, Caparol and Boonstoppel, tools and related products. The wholesaler supplies painters, contractors and technical services and gives advise about the application, substrate and treatment. 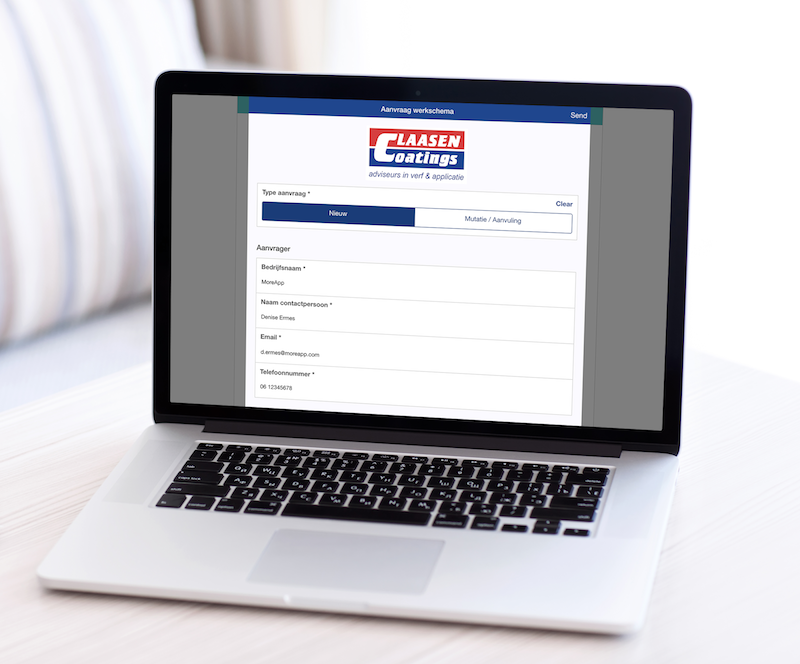 Claasen Coatings uses the mobile form app for a work schedule application form. The client can use the Claasen Coatings Connected app for Android, iOS and Web (branding) to pass on what kind of activities a work schedule can be created. The requests that came in by telephone or email before where missing a lot of information. As a result, the company had to return to the location of the painting multiple times if the client provided additional information later. Claasen Coatings asked MoreApp partner, Bas Hania from Meet Moore, to look for a solution. The ease of submitting an application was the most important factor when searching for the perfect tool. Due to the speed of creating forms, the choice quickly fell on MoreApp compared to other providers such as Google Forms. Claasen Coatings values its own identity. That is why the company has chosen for its own branded app. The company is proud of their mobile form app. The clients really submit an application using the Claasen Coatings app. Clients are positive about the Claasen Coatings Connected App. Clients can now see immediately in the mobile form app which information is required for a complete application. The application will now be sent to the Claasen Coatings technical team via email with complete information. The client also receives a copy of the form by email.